The rabbit occupies an unusual position in the animal kingdom. Some people keep pet sheep, cows or chickens. Some people eat guinea pigs and dogs. But only the rabbit enjoys widespread popularity as companion and comestible. I’m quite lucky in that I’ve never liked rabbit meat that much so there’s no cognitive dissonance involved in my owning two bunnies as pets (l-r: Mymble, Goat). It’s a fair bet that cat owners don’t have to put up with “YUM YUM” style jokes all the time, though. But why a rabbit? House rabbits (ones who live indoors and – in theory at least – get to run around a lot) are the third most popular pet in the US after cats and dogs: the days of supine hutch-dwelling are largely over. Rabbits aren’t exactly low-maintenance, though: as well as regular cleaning out you need to keep your house rabbit-proof, feed them a lot and give them as much playing time as possible. They’re friendly creatures but not generally in a pick-up-and-cuddle sort of way. So what, beyond obvious cuteness, is the appeal? I like owning rabbits because they’re intelligent enough to be curious, to play and to do interesting things but not so complex as to be wholly alien. You can work them out without having to anthropomorphise them. There’s a satisfaction in understanding rabbit stimulus and response and then engineering their environment to keep them happy. I’m also a hands-off pet owner so I’m quite happy with the rabbit style of play, which is generally to run up, nudge, and run away again (with many variations on this). It’s also pretty much as cheap to keep two of them as one, and there’s a special pleasure in watching them play together, socialise and groom. 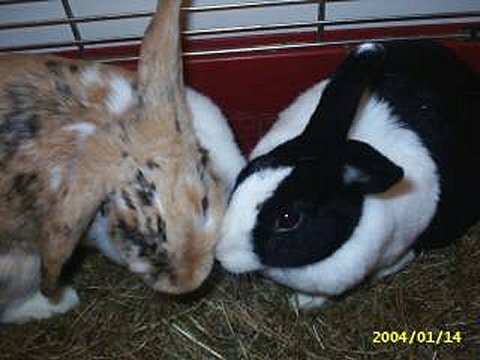 It may not be quite as magical as seeing a pair of kittens romping but rabbits seem to bond quite strongly and these bonds last throughout their lives.